Antique Latch, Gold Latch, Black Nickel Color Latches. The LT-40 latches are heavy duty models. They come with easy open and easy lock steel spring ball to lock or unlock easily. They are designed for cigar box purses, wood craft boxes, windows or cabinet locking system. With antique, gold, black nickel and nickel color option available. 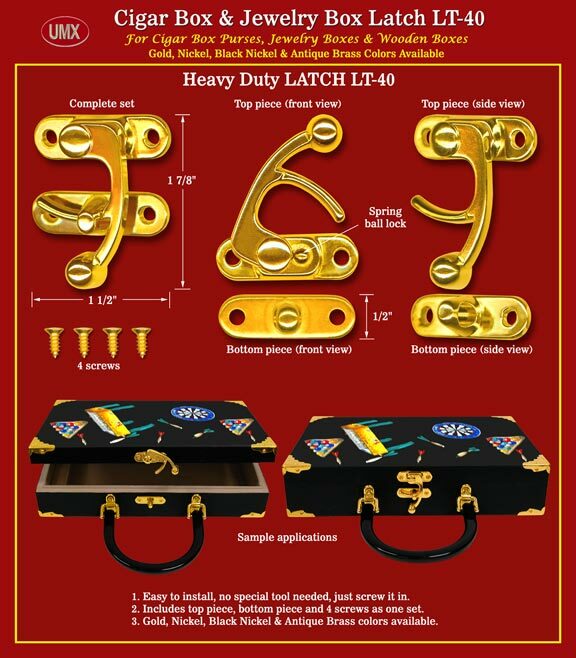 Latch: Cigar Box Purse, Wooden Boxes, Cigar Box, Box Purses, Wood Jewelry Boxes, Cardboard Paper Box, Gate, Window, Drawer, Cabinet, Door and Tool Box Latches Hardware Supplies.